I’m becoming more and more impressed with the usefulness and well-thought purpose of what just may be the only print magazine written specifically to merge the current mainstream music paradigm(s) with the traditional-based music 7-12 public curriculums. For years, In Tune Monthly has been publishing some of the best music making materials and ideas available today that are specifically targeted to cultivating a sound musical foundation by utilizing the music that the younger generations are passionate about. Not unlike any good music education program, In Tune Monthly explores all aspects of music making from how it is created and learned to how it is performed, recorded, and distributed. Each issue features music groups, bands, people, and places that are both current and timeless From Beethoven and Henry Mancini to Quincy Jones and High School Musical, this magazine is a one-of-a-kind amalgamation of all that is best in music and music education. This is a magazine specifically written, in both an educational and entertaining manner, that targets the middle-to-high-school age student or musician (..although I find it very informative myself!). 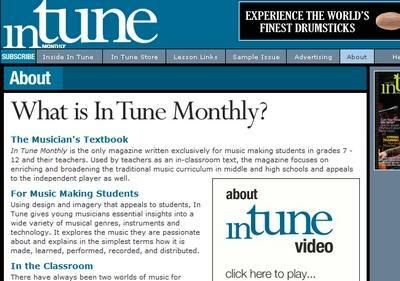 As a music educator, it is quite easy to see the appeal that the students see with In Tune Monthly, the magazine itself has a beautiful “eye-popping” and “fun” layout and is full of the latest gear reviews, artist write-ups, and song and composition evaluations. A very wide range of topics can be found within each issue from how to write pop-song lyrics to in-depth information about the anatomy of the french horn. While there are many instrumental or group specific “trade” type magazines, In Tune Monthly has not catered to any specific music performance niche. Within it, you will find articles about choirs, marching bands, orchestras, jazz, classical music, rock, hip-hop, recording, brass instruments, guitars, electronic and acoustic gear, and anything else that you might imagine. Through it all, In Tune Monthly surprisingly, makes such seemingly diverse content blend perfectly into one smooth and interesting “read”. The magazine puts a tremendous amount of thought into teaching pedagogy as every issue has various articles related to music theory, music practice, music business, or the industry in general. For example, the February 2009 issue included a great article called “Arpeggios and altered chords” and gave a good, fairly in-depth, analysis of breaking up, suspending, altering, and clustering chords. Also, each issue has a special “teacher’s edition add-on” that relates almost all of the articles to the National Music Standards, suggests further listening and reading options, and even provides student worksheets and assessment materials such as quizzes and testing ideas. The magazine really is well thought out and implemented. In addition to the “physical magazine”, there are a number in-tandem web related resources and online “bonus materials”. One of the great issue-related features that may be found on the web is their “In Tune Listening List” that allows anybody to listen to related music and bands written about in the magazine articles. They even have a great FACEBOOK integrated presence. I’m not sure why there is such a great dichotomy and so many self-imposed distinctions between mainstream music and musicians and those of the traditional “older schools”. There doesn’t have to be as, in the final analysis, all musicians are creators and makers of music -regardless of the specific music genre or venue…. We all partake from the same wellspring of creative abstracts, melodies, and harmonies. Regardless of which side-of-the-fence you are on with regard to either traditional or mainstream forms of music, In Tune Monthly does an excellent job of ignoring the fence-work altogether and provides a solid, informative, and useful music product with each printed issue. Calling it a “musician’s textbook” really is not too far from the truth. I’d love to hear from any of you that are using this magazine in your classes and how you are implementing it into your teachings either via the comment section below of drop me an line using our contact form.